iPad Pro 9.7-Inch vs. iPad Pro 12.9-Inch: Which Size Fits You? Apple recently unveiled a 9.7-inch version of its newest tablet, the iPad Pro. This is a smaller version of the iPad Pro the company announced in the fall. Tech-forward trendsetters might be looking for an upgrade, but what besides size makes the new model different from the previous one? And which one would you be better off buying? We’ve compared the more affordable new 9.7-inch iPad Pro against its 12.9-inch iPad Pro sibling to help you pick the right Apple tablet for you. What we found: You win some, you lose some. The 9.7-inch iPad Pro has a smaller screen than the 12.9-inch model, but it’s $200 more affordable. What you’ll learn: The bigger iPad Pro is a good match for artistic professionals, whereas the new, smaller version is suitable for the everyday user. In a nutshell, it’s a souped-up iPhone 6S in tablet version. On the outside, it’s hard to tell the difference between these two models — aside from their size, of course. The 9.7-inch Pro is smaller and easier to transport than its 12.9-inch predecessor and weighs in at 0.96 pound, compared with 1.57 pounds. Each tablet features an LED-backlit, multitouch Retina display housed in a sleek casing. Both models are sold in silver, gold and space gray; the 9.7-inch also comes in a rose gold finish. Touch ID: iPad Pro owners can keep their tablet secure from other people by using their fingerprint to unlock the device, secure personal data and make purchases from the App Store. Apple Pay: Just as with your phone, make payments with your iPad by using Touch ID within apps. Siri: Apple’s voice-activated assistant allows users to send messages and essentially use their iPad Pro without even touching it. Long battery life: The iPad Pros offer up to 10 hours of battery life when surfing the Web on Wi-Fi or up to nine hours using a cellular data network. Take better pictures. The 9.7-inch iPad Pro has a 12-megapixel rear camera and 5-megapixel front camera. Compare that with the 12.9-inch model, which has an 8-megapixel rear camera and 1.2-megapixel front camera. Additionally, the smaller Pro gives users the ability to take Live Photos — pressing on an image to turn it into a short video. Shoot better video too. It’s not just pictures and selfies. The 9.7-inch Pro also provides clearer video with its capability for 4K recording — something the 12.9-inch version can’t do. Enjoy a brighter display. The 9.7-inch tablet includes a True Tone display that uses ambient light sensors to adjust color and intensity for viewing in every environment. This is a boon for users who read on their iPad, especially outdoors. 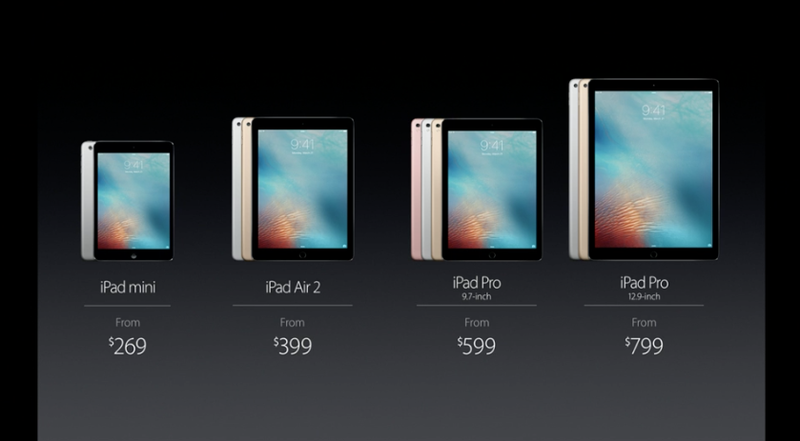 The 9.7-inch version starts at $599; the 12.9-inch display model begins at $799. Both tablets include a Lightning-to-USB cable and USB power adapter in the box. But for more room to store your pictures and videos, expect to pay more than the starting price. The price goes up for both models depending on storage capacity. And for versions that can hook up to cellular networks, the price goes up even more — plus you’d need to tack on extra for a monthly cellular data plan. Keep in mind that all those great-looking pictures and videos take up space, so you’ll probably want to spring for more memory. The 128GB 9.7-inch Pro is $749; the 12.9-inch is $949. If you want the maximum 256GB, you’ll pay $899 for the 9.7-inch Pro and $1,099 for the 12-9 inch model. Regardless of which size tablet you choose, you may be shelling out money for more than just the device itself. Both of these iPad Pro versions are compatible with two key accessories: Apple’s Smart Keyboard for turning your tablet into more of a traditional laptop and the Apple Pencil for drawing directly on the tablet’s screen. The Smart Keyboard for the 12.9-inch iPad Pro costs $169; the same accessory for the 9.7-inch is $149. The Apple Pencil retails at $99 for both models. So which iPad Pro should you add to your technology collection? If you don’t need a bigger screen and want better photo and video capabilities, go for the 9.7-inch. The $200 you save is worth the trade-off. But if you’re searching for something closer to a personal computer, go for the 12.9-inch. This one is especially fitting for artistic professionals who will use the Apple Pencil as their paintbrush and the iPad Pro as their canvas, as it gives more display area for users to explore. Super casual users who don’t need the speed of a Pro model can always opt for the iPad Air 2, which starts at $399.